The New Google Beta Search Console is Rolling Out! Virtually anyone who creates online content knows that Google drives search engine optimization and their updates are frequently released with little fanfare. This time, we’re getting advance notice of a new update, this one concerning the beta version of a new Search Console. The updated version will soon be available to everyone, though it will most appeal to those with an interest in analyzing search performance, index coverage, and AMP status. For users concerned about losing their favorite features from the classic Search Console, Google has also shared that both versions will be available for use simultaneously. While the update will be available to the public, it’s still being amended to include all of the features of the classic version. Until that process is complete, Google will keep both versions running, so users won’t have to worry about an interruption to the quality of the service. Users can access either or both versions by clicking on a link in the navigation bar. So what’s Different in the New Search Console? One of the most widely anticipated changes is the addition of over a year of data added to Search Performance reports, which will give website operators greater insight into their SEO performance. Along with that change, the updated Search Console allows for reports of critical errors to be shared with multiple members within an organization. Again, the goal here is to expand transparency, because Google feels this is the best way to resolve issues in less time. 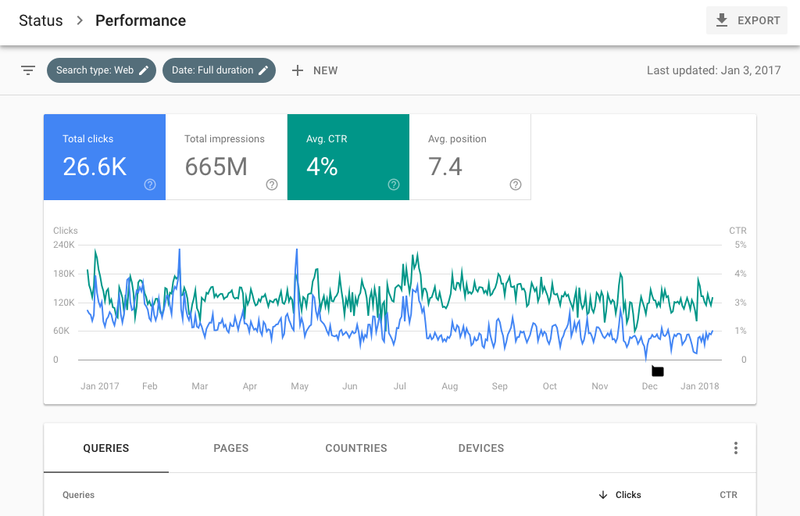 The Search Analytics report will be replaced by a Search Performance report and will cover 16 months, arranging the information to more efficiently share data according to clicks, impressions, CTR, and average position. Users can also filter and sort the report, selecting criteria such as web, image, or video results. The report can also be sorted by query, page, country, or device type. Similarly, the Index Coverage report will replace the Index Status report. As with the old version, the newly revamped report will also show website operators how well Google is indexing their website, but will also provide greater insight. 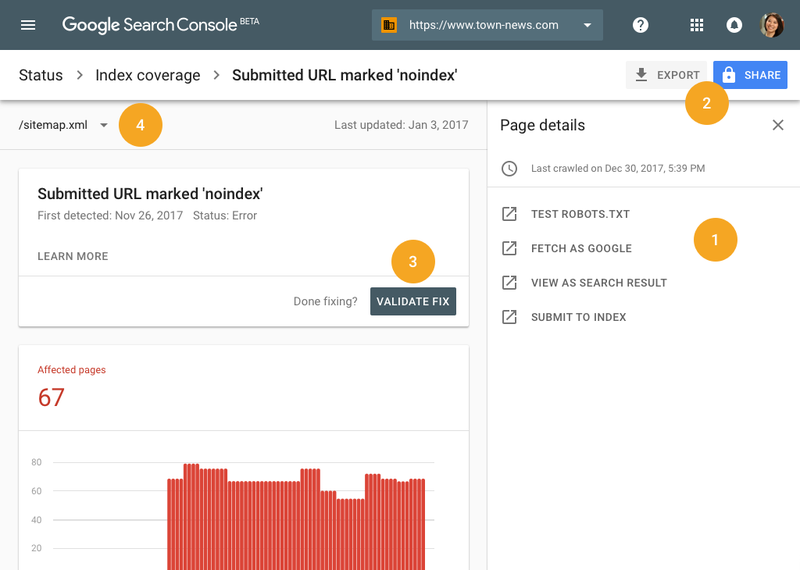 The Index Coverage report will identify problems that may be affecting how Google ranks the website. The report will also indicate why a URL may not be getting indexed at all. In giving a timeline of performance, the report will also show how search engine optimization improvements have affected performance. Users can click on a URL error message to bring up diagnostic tools that will help them identify the weaknesses in their website’s performance. The URL can then be resubmitted for indexing. In sharing these changes, Google recommended that website operators submit sitemap files to achieve the best results. The new AMP Status report helps users see how their sites are performing via mobile devices. The report does much more than simply point out issues with a URL. It will help diagnose the problems, repair the issues, and test the fixed URL to ensure its operating as a valid site. The fix can be applied across multiple pages in the same website, reducing the time and effort it takes to correct a problem. After users resubmit the fixed website, Google will “crawl and reprocess the affected URLs with a higher priority” to achieve improved performance. Google has also added a Job Posting report update for websites that post jobs within their organizations. The report will display statistics related to the postings and point to any issues that exist. Options for resolving those issues will be recommended. As always, Google is interested in feedback about the Search Console update. To offer insight, users can click on the “Feedback” link and fill in the fields. The goal is to improve their services, so they assure website operators that every concern will be taken under advisement. We hope this post was useful! Be on the lookout for these fantastic new features showing up in your Search Console account. Have a Happy Holiday & Peaceful New Year! Ready, Set, Is Your Site Mobile Friendly?